When I retrieve the paper in the morning I open the front door a crack and peer out. I then open the door wider and step out on the stoop all the while talking loudly to myself. I am not quite sure what I say, but I make some noise. As I start down the walkway I stomp my feet like a young boy having a temper tantrum. I make solid, firm stomps that are noisy, clear and crisp and at 5:30 in the morning it probably sounds a bit strange. Since I have started doing this I have not encountered a neighbor or anybody else for that matter. It’s been about 4 weeks. Ever since the last sighting. Sighting? You might be thinking UFO, Leprechaun, Ghost, Racoon. We live in Los Angeles. I thought I would mention that before I reveal what I am afraid of at 5:30 in the morning. I am afraid of the big fat bear. Yes, that’s right a big FAT (He is really fat. Jenny Craig would have a field day with this guy) black bear. I guess he is a black bear but he is actually brown. Go figure. I am not going to worry too much about his skin color. I am more worried about his teeth. 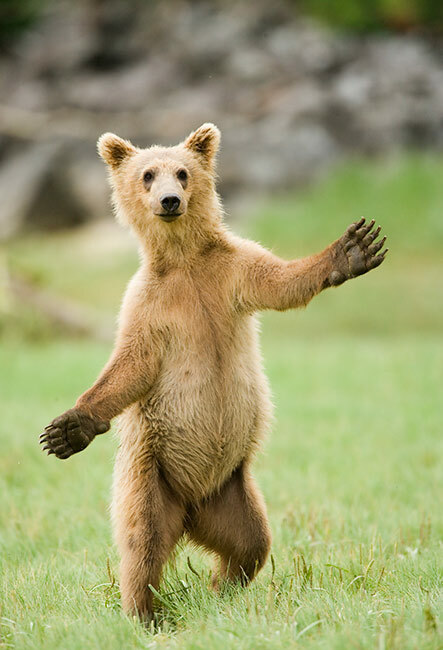 The experts say never startle a bear. You could scare him and he might attack. Did the experts ever think about me? Who could possibly be more startled than a guy going to get his paper at 5:30 am with no shoes on and to look up and see a bear on his front lawn. Now this has not happened yet, but the whole thing plays itself out in my head every morning. Damn, I have to get the paper I think to myself. Where are my car keys? What am I going to do if he’s out there. Should I jump on the hood of my car? Will anyone hear me when I scream or will they simply turn over in their beds thinking they were having a nightmare? These thoughts started recently, but grew worse last month when I saw the Fatso standing on his hind legs across the street. He must have been pissed because there was nothing to eat in the neighbors trash can. It was Friday night. The trash is picked up on Friday mornings. He ain’t that smart a bear now is he (Yogi)? When I saw him I started making noises. Again, I am not sure what kinda noises, but I guess the kinda noises anyone makes when they see a bear. The bear freaked and started to run and I mean run. That sucker was fast. I am not sure how something so large could run so quickly. Before I knew it he was gone, over a fence and out of sight. This all seems kinda funny. The Monrovia black (I mean brown) bear strikes again. Over the past few years he has been known to go skinny dipping in the pool down the road. I always thought that was amusing too, until this incident and the fact that I’ve had huge bear prints in my compost pile 2-3 times in the last couple of weeks. Maybe we’ll have to move to Montana or something. I can probably retrieve my paper there without any problem.